Gandalf has released a new MBR+UEFI bootable 2GB 64-bit Win10 PE ISO with WoW64 support based on ChrisR's WinBuilder project for download here. This can be added to E2B as a FAT32 .imgPTN file (details as in previous blog here). 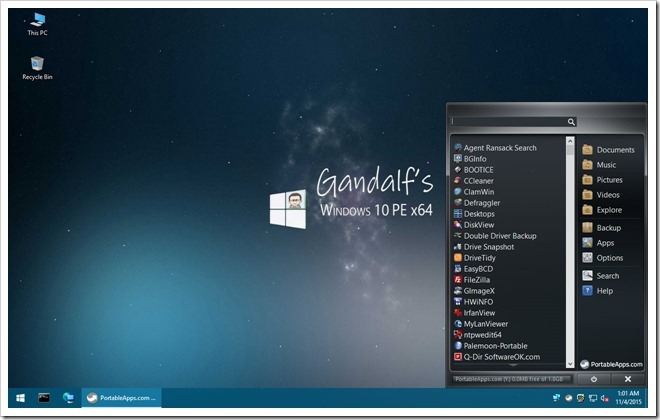 Note: E2B v1.90+ now includes automatic support for WinBuilder-based ISOs such as Gandalf ISOs. Just two simple rules: 1) keep extension as .iso, 2) no spaces in filename. Another way to boot it, is to rename the ISO to it's original WinBuilder name of \WIN10PESE_x64.ISO (for the 64-bit version) and place it in the root of the E2B drive. Then copy the "\_ISO\docs\Sample mnu files\Windows\WinBuilderPE_ISO.mnu" to a suitable menu folder (e.g. \_ISO\WINPE) and then edit it with the correct ISO name. # Note the date is correct as 11-07-2016 even though the ISO is 11-10-2016! I also stumbled across 'Gold' XP 2016 SP3 Install ISO here. This seems to include drivers and software and is also activated and so is illegal to use, but I wanted to see if I could get this to work with E2B just for the sake of curiosity. It can be added to the XP folder on E2B, but because it is modified, there were a few issues (although it did install). You can also try using WinSetupFromUSB to make a .imgPTN file as described in my earlier blog here. After installation (which is a 2-step process) you can then install a variety of software packages which are automatically displayed on the Desktop. DPMS drivers seem to be nLited in already because I could install to a SATA drive without using the DPMS version of E2B. After some experimenting I came up with a .mnu file for it (for a single-hdd notebook) - Gold_XP_2016_Install.mnu - which you can download from the E2B Alternate Download areas if you wish (will upload soon). For some reason the final Software Install menu does not appear though, but you can load the ISO as a virtual drive (e.g. using ImDisk) and then install the remaining software packages from the ISO (it should auto-run). The Gold theme is pretty unreadable, but luckily you can change it to a different theme in the normal way. The Timezone is set to Tashkent by default and Region as USA, and it has the POS2009 fix so that MS Updates will work too! The Romanian language also seems to be installed (selectable from the SystemTray 'EN' icon). All-in-all a pretty slick way of installing XP SP3 quickly (if anyone still wants to use XP!). If you do install XP, please ensure you have a licence! I also came across the Dream Boot CD 2015 by 'Computer Media Corporaton' on the same site. This appears to be a modified version of DLCD and works OK on E2B if you convert the ISO to a FAT32 .imgPTN file. It contains a MiniXP and Mini7 x86 Enterprise PE and is set up for Saudi Arabia but is in English. MinXP and Mini7 seems to work OK, but not all Hirens features seem to be present (e.g. pmagic) and some do not seem to boot correctly. Dreams 2017 v6 also works when converted to FAT32 .imgPTN. If you want to add ISOs to the \ISO folder after conversion (for AV, etc. ), you will need to increase the size of the .imgPTN file when prompted. An alternative approach would be to extract the contents of the Dreams ISO to an empty folder, then add the extra .iso files to the .\ISO\ folder and then drag-and-drop the new folder onto the MPI_FAT32 shortcut.